59 West 44th Street, 10028 New York, United States of America. It is a elegant hotel in manhattan. Algonquin Hotel is an emblematic establishment combining a classic elegance, a quiet refined atmosphere and a central location. It is situated in midtown manhattan, one of the best places from new york. Newly refurnished hotel has 174 rooms combining a classical and elegant decoration with the comfort and the facilities of the 21st century. Great celebrities of arts and literature world, such as Dorothy Parker or Harpo Marx, spent the night in this establishment. 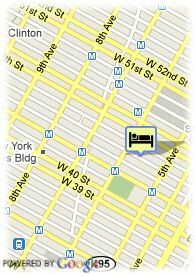 It is perfect for tourists, as well as for business travelers arriving at New York and looking for an exquisite stay. Disposing of two restaurants, The Oak Room and the Round Table Room, they are in fact spaces with excellent gastronomy surrounded by a decoration, cared until the last detail. The offer is complete with a business center with 3 events rooms, reunions, conventions and seminaries for until 100 people, perfect for the work reunions. 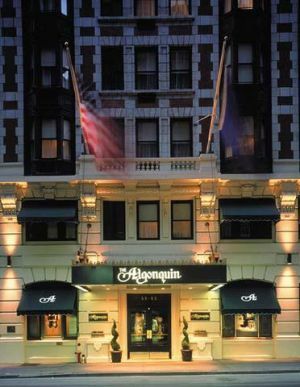 The hotel algonquin is an ideal option in order to enjoy the most elegant part of new york, being located next to the points of interests of the city, such as Broadway, the 5th Avenue or times square.